The Mineralogical Society of America (MSA) sponsored a short course by this title December 1990 at the Cathedral Hill Hotel in San Francisco, California. It was organized by the editors, Jim Nicholls and Kelly Russell, and presented by the authors of this volume to about 80 participants in conjunction with the Fall Meeting of the American Geophysical Union. Igneous petrology, in its broadest applications, treats the transfer of matter and energy from planetary interiors to their exteriors. Over the past several decades igneous petrology has gained sophistication in three areas that deal with such transfers: the properties of silicate melts and solids can be estimated as functions of pressure, temperature and composition; some results of experimental and theoretical studies of the physics of multiphase flow are available; and many of the algorithms for realistically modeling magmatic processes are in place. Each of these fields of study, to some extent, have to be pursued independently. 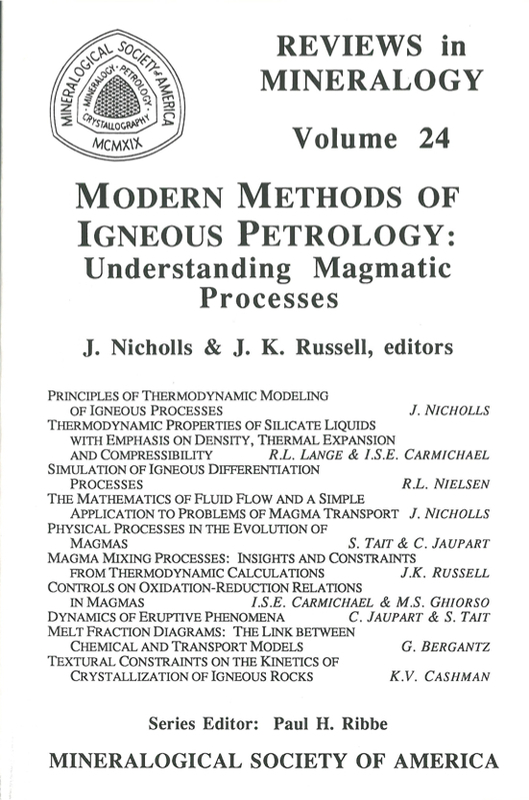 In our opinion, now is an ideal time to collect some features of these studies as preparation for more integrated future work and to show some consequences of applying current ideas to the study of igneous processes. We have attempted to bring together the basic data and fundamental theoretical constraints on magmatic processes with applications to specific problems in igneous petrology.